One way or another, handmade beehives are designed to provide the bees with shelter from the elements, a space to raise brood, a space to store honey, and adequate ventilation so that the bees can regulate the colony’s temperature. In addition, modern hives provide the beekeeper with the ability to inspect, manipulate, and manage the colony. So exactly what kinds of conditions cater to these necessities? 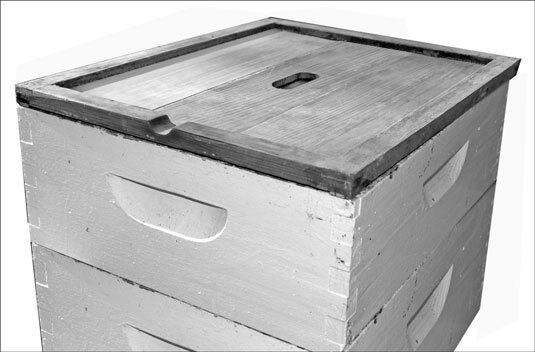 The Langstroth hive is the most widely used hive in the United States, and it’s gaining popularity worldwide. Here it illustrates the basic components of a hive and their function. The basic components of a Langstroth hive. A hive stand isn’t necessary, but you may find one useful because it elevates the hive off the wet ground, which improves air circulation and results in less bending over when you’re inspecting your hives. In addition, grass growing in front of the hive’s entrance can slow the bees’ ability to get in and out. The stand alleviates that problem by raising the hive above the grass. A bottom board is the floor of the beehive. It consists of several rails that serve as a frame around a solid piece of wood, and it protects the colony from damp ground. These days, more and more beekeepers are using what’s called a screened bottom board in place of the standard bottom board. This improves ventilation and is helpful when controlling and monitoring the colony’s population of varroa mites. An entrance reducer is a cleat that limits bee access to the hive and controls ventilation and temperature during cooler months. You don’t nail the entrance reducer into place but rather place it loosely at the hive’s entrance so that you can introduce it or remove it as needed. The small notch reduces the entrance of the hive to the width of a finger. The large notch opens the entrance to about four finger widths. Removing the entrance reducer completely opens the entrance to the max. If the hive design you choose doesn’t use an entrance reducer, you can use clumps of grass to close off some of the entrance. The deep hive bodies are essentially boxes that contain frames of comb. For a Langstroth hive, you typically build two deep hive bodies to stack on top of each other, like a two-story condo. The bees use the lower deep as the nursery or brood chamber, to raise thousands of baby bees. They use the upper deep as the pantry or food chamber, where they store most of the honey and pollen for their use. If you live in an area where frigid winters just don’t happen (temperatures don’t go below freezing), you may not need more than one deep hive body for your colony (one deep for both the brood and their food). In such situations, you want to monitor the colony’s food stores and feed the bees if their supplies run low. Beekeepers use honey supers to collect surplus honey. That’s your honey — the honey that you can harvest from your bees. The honey that’s in the deep hive body must be left for the bees. Supers are identical in design to the deep hive bodies, and you build and assemble them in a similar manner. But the depth of the supers is more shallow. Honey supers typically come in two popular sizes: shallow (which usually measure 5 3/4 inches high) and medium (which usually measure 6 5/8 inches high). Medium supers are sometimes referred to as Illinois supers because they were originally developed by Dadant & Sons, Inc., which is located in Illinois. Some prefer medium supers to shallow supers and use mediums exclusively. Why? The mediums hold more honey and yet are still light enough that you can handle them fairly easily when packed with golden goodness (medium supers weigh in at around 50 to 55 pounds when packed full). However, many beekeepers use shallow supers because they’re just that much lighter when filled with honey (they weigh around 35 to 40 pounds when packed full). The choice is yours. You can use medium-size equipment for your entire Langstroth hive (no deeps). Three medium-depth hive bodies is about equivalent to two deep hive bodies. Standardizing on one size means that all your equipment is 100 percent interchangeable. The lighter weight of each medium hive body makes lifting much, much easier than manipulating deep hive equipment (in comparison, deep hive bodies can weigh up to 100 pounds when full). As the bees collect more honey, you can add more honey supers to the hive, stacking them on top of each other like so many stories to a skyscraper. For your first season, build one honey super. In your second year, you’ll likely need to build two or three or more supers. Honey bonanza! 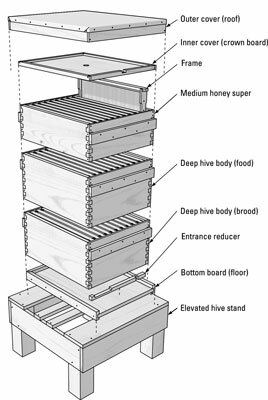 Some hives use removable frames (for example, nuc, observation, British National, and Langstroth). The bees build their honeycomb onto the frames. Because the frames are removable from the hive, you can easily inspect, manipulate, and manage the colony. For the nuc, observation, and Langstroth hives, the wooden frames contain a single sheet of beeswax foundation. Frames typically come in three basic sizes: deep, shallow, and medium, corresponding to deep hive bodies and shallow or medium honey supers. You can certainly purchase frames from a beekeeping supply vendor. Or you can find out how to build your own Langstroth-style frames. The inner cover of the hive resembles a shallow tray (with a ventilation hole in the center). You might also like to cut a notch in one of the short lengths of the frame. This is an extra ventilation source, positioned to the front of the hive. You place the inner cover on the hive with the tray side facing up. Langstroth-style frames (left) and top bar frames (right). For the correct placement of an inner cover, the tray side faces up. Alternatively, screened inner covers have been gaining popularity in recent years. They provide the colony with terrific ventilation. You do not use the inner cover at the same time you have a hive-top feeder on the hive. You use the hive-top feeder in place of the inner cover. The outer cover protects the bees from the elements. Like the roof on your house, you can ensure that it’s waterproof and also extend the life of the wood by covering the top with a weatherproof material (aluminum flashing, asphalt tiles, cedar shingles, and so on).